The Facebook Fan Page Directory aims to allow users to find Facebook Fan Pages more easily, allowing browsing of categories and companies in alphabetical order and removes the need to rely on the notoriously cumbersome Facebook Search mechanism. The Facebook Fan Page Directory is the first in a number of changes that Facebook are planning to implement over coming weeks to improve user experience. I wrote about the launch of Facebook Fan Pages here and I have now used the new Facebook Fan Page search mechanisms to look at what the most popular fan pages are. 'Apple Students' is a popular page, though the main aim of it seems to be to offer a student discount voucher. Fashion page with PINK news downloadable Facebook widget, opportunities to PINK your photos and read your PINK horoscope. 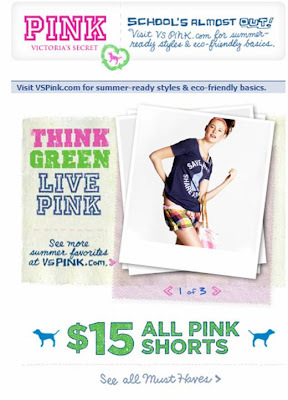 Also promotes PINK summer collection and offers a $15 discount on PINK shorts. 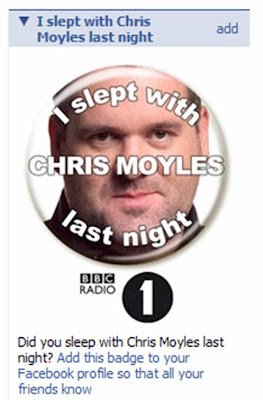 Nicely executed page and clearly popular with their target audience! 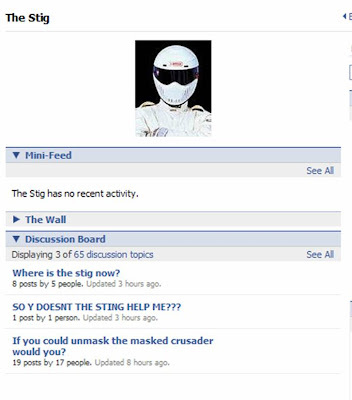 The Stig, test driver from the BBC Top Gear motoring programme is the 5th biggest Facebook Fan page, but doesn't seem to have very much at all on his page - random! 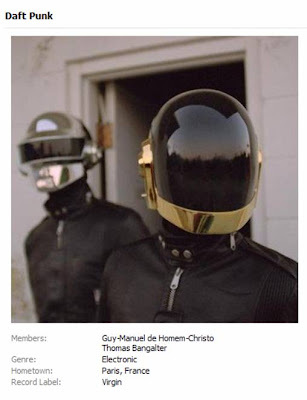 Daft Punk have created an impressive Fan Page with YouTube links to Daft Punk videos, Daft Punk discographies, Daft Punk photos and Daft Punk RSS feeds. The kings of digital music seem to have mastered Facebook fan pages and are the highest listed music act. 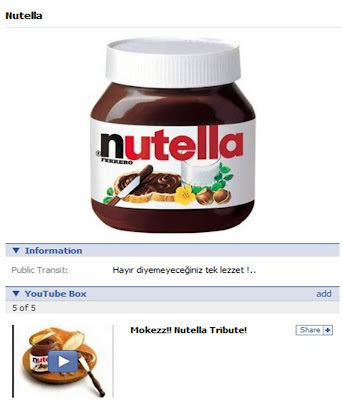 I doubt that anyone would guess that Nutella have the highest ranking product specific Facebook Fan Page. Various photos, YouTube links, fan debates and nuggets of product information - I'm still amazed that people can be so passionate about an everyday product! H&M have a good looking Facebook Fan page and I wanted to note their efforts too. The H&M Facebook Fan Page is updated regularly with new looks, links to a variety of things (such as the H&M virtual dressing room) and is a hub for a lot of H&M digital initiatives. One for others to try to emulate! Since launch late last year Facebook Fan pages have had widespread take up and now that users can search and browse more effectively Facebook Fan Pages may become even more popular. I will update this list from time to time as things change. I will also try to contrast the performance of Facebook Fan Pages against Facebook Groups which I have previously written about here. I just watched the You Tube video on your site and it dawned on me that when Americans say 'You Tube' it sounds like they are saying 'U2'. When he asks the guy, 'What's your favourite You Tube video?' I thought he was going to say something like 'The Fly' or 'Where the streets have no name', so I was taken aback when he replied 'the skateboarding dog'. Just thought I'd share that. It just dawned on me that an American once again invented something the rest of the world can't get enough of. I mean, Where the Streets Have No Name. Not sure how old your list is, but wanted to point out a fan page that should be listed here. http://www.facebook.com/heyheyitssaturday?ref=ts At the moment it has 295,825 fans and it's constantly growing. Haha these are hardly large! Lady Gaga is pushing 6,000,000! Facebook Page with most fans is Texas Hold'em Poker ... more than 17 million fans!! I think this one is new but it is freaking awesome for all parents. Great list and some icons not coming from US is going to be included in the list. 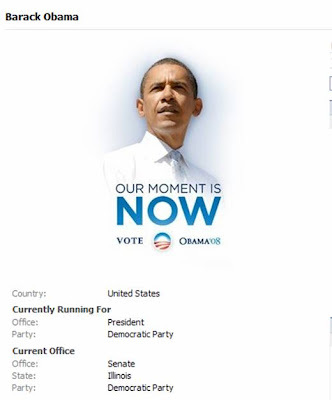 This is an old post, but Obama is still leading till this date. I guess so.